The July 4th Mr. Firecracker and Miss Independence Essay contest is sponsored by the Seward Rotary Club. Phil Bangert is the Project Chairman. Essays are judged by a volunteer panel of members of the Seward Rotary Club. The Rotary Club has sponsored this project since 1967. The students are honored at the Chamber Kick-Off Luncheon, read their essays there and are also guests with their families at a Rotary Luncheon and read their essays at the Rotary Club meeting. 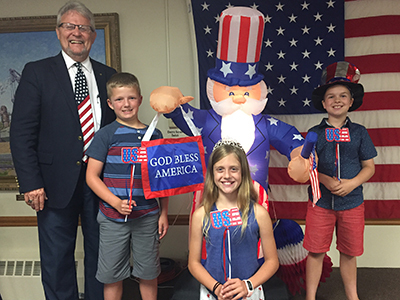 They attend the Governor’s Reception on July 4, ride in the Grand parade and read their essays at the Bandshell on July 4. They all receive a trophy and bag of fireworks and their photo and essay are printed in the local, Special Edition of the Seward Independent. Their essays are also placed on the Seward July 4 website. I have lived in Seward my whole life and there is no place I would rather call home. I have been to nine 4th of July parades, had my school picture taken about six times (including preschool and kindergarten), and have been to the library more times than I can count. Seward is an amazing place. Let me tell you why I love it! The churches and schools in Seward are the best! They let us get together with friends and family. There are fun programs you can be a part of like Reading Classic and Vacation Bible School. At school we get to have fun and learn at the same time. The teachers there are helpful in every way. The library has loads of books and tons of fun activities in the summer and fall. People can go to LEGO club, Maker Camp, Chess club, and craft nights. When I was little I went to Story Time and learned about letters, numbers, colors and shapes. The library is even better because my mom works there! Concordia University is a big part of Seward. My dad teaches art there and sometimes I get to spend time on campus. I like to eat waffles, French fries, ice cream and more in the Janzow cafeteria. Concordia also has an amazing rock museum in the basement of the library! Seward has many great restaurants and stores. I like to eat out in Seward and some of my favorite restaurants are the Dragon Palace, Dairy Queen, and Sparetime. Shopping at stores like Chapters or Et-cetera is fun to do! I also like to go to JD’s Coffee Shop and get my personal favorite drink, hot chocolate. Seward has an awesome Farmer’s Market by the Courthouse on Wednesdays and Saturdays! It’s a great place to get pumpkins, soap, cinnamon rolls, spaghetti sauce, vegetables and more. I love Seward’s Plum Creek Trail – the place we run, jump, bike, or skip. Sometimes I bring along a net and catch frogs and tadpoles. One time we saw wild turkeys on the trail! Also, fishing at independence Landing is a great way to spend a weekend. And of course the Seward County Fair is something I look forward to every year. I like to enter things I’ve made in Open Class and win prizes and money. You can go to the pool and swim or even just hang out. Seward is a very fun place to visit, especially on the 4th of July. If you’ve never seen a Seward 4th of July parade, I highly suggest doing it. There are marching bands, fire trucks, candy, and floats for people like Mr. Firecracker and Miss Independence! BOOM! You can hear the firecrackers cracking throughout the town. Seward is the best place in Nebraska to celebrate the 4th of July. Though I may not live in Seward my whole life, it will always be home. Seward is a great place to live and grow up in. I created a poem to tell you some of my favorite things to do in Seward. I hope everyone has a chance to visit Seward and see all the special things it has to offer! Seward is such a great town, so it will be hard to explain in words. It has fun camps for kids to try out. I like to go to the pool to play in the water with friends and get snow cones. I also like to stop by JD’s to for hot coco and to play a board game. I love to stop by Chapter’s Books and Gifts to read some books I can’t put down. I love history, so it is interesting to go to the National Guard Museum. It teaches you about the service of soldiers and the Guard. Seward is a great place to bike and I can ride almost anywhere, so that makes it all the better. It has a lot of bike trails and l like to on bike adventures with my friends and family. I like going to Concordia basketball games and hanging out with college friends. I like to read a lot, so the Library is a great place for me. I go there all the time to check out awesome books. It has fun activities in the summer and magicians. My brothers and I like to stop by the Bandshell and do performances for our mom and dad. I also enjoy walking to the square and looking in the shops. I watch movies at the Rivoli Theatre while eating popcorn with my family. The county fair is so fun. It has rides, games, the rodeo, food, and animals. I like to visit the cute little rabbits and I love to visit the strong and majestic horses. We eat and watch the rodeo. Then at the end of the day my family gets on the Ferris wheel and then we head home. Who could forget one of the greatest days of the year… 4th of July! With booming fireworks and a grand parade, we truly are the 4th of July City. I like to look at all the stands of jewelry, food, and other goodies. The parade goes right by our house and we have a bunch of friends and family over. Then we end the day with brilliant fireworks and sparklers. It is a wonderful day. I like to visit all the parks and play outside. I like to go sledding down the many hills we have here in the winter. I also like the ability to walk to many of my friend’s houses because we are a small town. In all, Seward is a great town to live and play in. I am very glad to live in such an amazing town. Why do I love to live in Seward? Imagine this. It is 100 degrees outside and you are so hot. In Seward there is a place to go to cool down, the Seward swimming pool. There are slides and diving boards for having fun. Do you have a dog and a small back yard? The dog park is the place for you. Your dog can run around all he wants and play with other dogs. Do you like to play sports? There are all sorts of fields and courts and all over town. You can even ride your bike to the soccer fields using the Plum Creek Bike trail. Do you like history? Seward has an excellent National Guard Museum where you can learn about those who served. Do you have something to celebrate? Seward has many great shops downtown to get a gift or if it’s your birthday you can go to La Carretta. They will put a sombrero on your head and whip cream on your face! Do you need help with something? In Seward, neighbors help each other out. Do you want to celebrate Arbor Day? We went on a field trip to the Civic Center to celebrate Arbor Day and plant a tree. Did you know that Seward is a Tree City USA? Seward plants lots of trees every year to make the town beautiful and help the environment. Do like parades? Seward is Nebraska’s fourth of July City and has a big parade every year. There is lots to see and do on the fourth too. There is also a Christmas parade the last weekend in November. Seward has a fabulous Christmas festival every year. Do you want to learn more about animals or nature or cooking or electricity? Seward has great 4-H program where you can learn about all sort of things. The extension staff and 4-H leaders are wonderful people who will help you learn and complete projects that you can enter in the Seward County Fair. Do you have a loved one that needs to be cared for? Seward has lots of caring people, from doctors and nurses, to places they can live when they can’t live at home. My great grandma lives at Ridgewood and they take very good care of her and my family. Why do I love to live in Seward? These are just a few of the reasons that make Seward a wonderful town! Winner from previous years are listed in order of Mr. Firecracker, Mr. Firecracker Runner-Up, Miss Independence and Miss Independence Runner-Up.